Wolf spiders: they are big, they are hairy, and they look scary…but they are primarily nuisance pests. Unlike many spiders, Wolf spiders do not build snare webs, they instead build retreats. They typically can be found under stones, timbers, and under decks. They may come indoors in search of prey, and if so, they tend to stay near floor level. 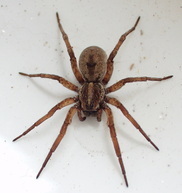 If wolf spiders are invading your home or garage, give Stomp Pest Control a call!